One of the greatest challenges we face is getting workers to care about issues that do not always directly impact them. But moving workers to feel a sense of solidarity with one another is also at the heart of the labor movement. So how exactly does this sense of camaraderie in a sometimes fractured workplace happen? 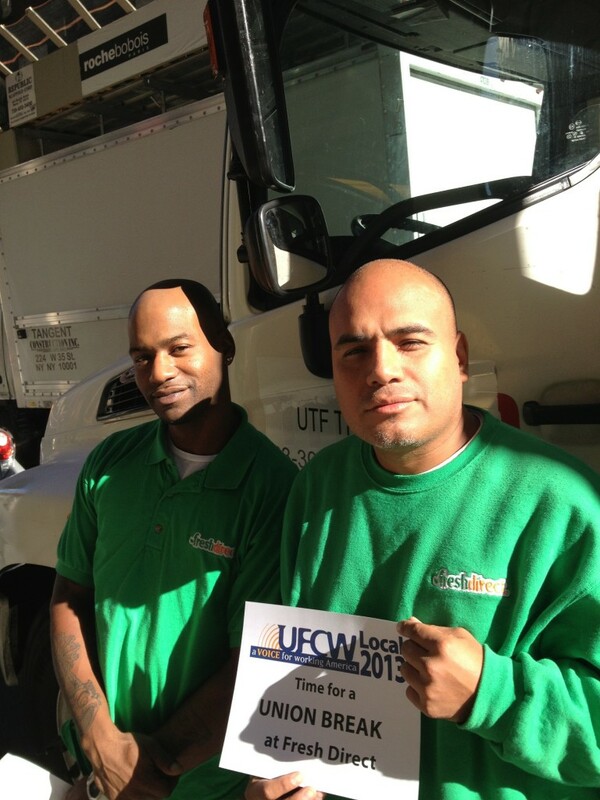 At Fresh Direct, the online grocery delivery service based in New York, members of Local 2013 had a pressing problem. Plenty of members were skipping breaks, and some complained that it was hard to find bathroom time during the shift. Stewards remembered that one member was terminated after he relieved himself in the lobby of a building in a moment of frustration. While that incident was too far in the past for staffers to address when they heard about it, it spoke to a larger problem: Why were members having such difficulty getting a break? Fresh Direct employs a just-in-time food delivery model that Amazon, Walmart, and other corporations are copying to get produce, prepared meals, and other perishables to the shopper’s door within a day of their online order. The company puts constant pressure on delivery workers to speed up. The amount of time to finish stops in a shift is reduced, while the number of stops increases. The territory covered by each worker grows wider all the time. The workplace culture encourages members to rush through their shift, too. Top performers who make the most on-time deliveries get a small bonus (and probably more tips from happy customers). We had strong contract language protecting paid breaks, going even beyond the guarantees of state law. But having a good issue doesn’t necessarily make it a winning issue. While some members were affected by the problem, others were not. Some segments of the workforce operate on more fixed schedules. Other workers with higher seniority feel comfortable pushing back against the boss. The union’s first challenge was to convince leaders that even if the issue didn’t directly affect them, it mattered. Monthly meetings offsite targeted different segments of the workforce, so nobody felt left out. Parking lot meetings brought 15 minutes of union conversation right to the doorstep. Stewards and the rep discussed the issue with the company during weekly grievance meetings, but the company’s promises to fix the problem were going nowhere. We decided to run a petition. Stewards and other leaders drove the petition. We asked them to map out their part of the workforce, and get 10 signatures each from co-workers. Soon we had almost 500 signatures, more than half the workforce. We put together a small delegation to deliver the petition unannounced. We challenged activists who weren’t directly affected by the issue to lead the delegation, in order to show management we had unity. The operations manager was not pleased, and the union activists got a good jolt from seeing his reaction. Management said technology problems would delay a solution. They promised three months, and when it came and went, we had to figure out our next step. We took another month or so to challenge management over its foot-dragging, which cost us some momentum. But when we refocused, we knew we had to escalate to make our point stick. Since members work mostly in isolation from each other, our challenge was to make sure that whatever members did was seen by everyone else. We had built a healthy text message list, with hundreds of members. We decided to challenge leaders to convince their co-workers to take a break all together at the same time. Our best chance for success was in the depots, about 20 locations where four to eight workers per shift congregate. The key for reaching the members was the lead at each depot, typically a more senior worker that newer members looked up to. We had built up a network of supportive leads through our monthly meetings. We relied on that group to pull off the action. We told management that we needed movement on the breaks issue. When they didn’t respond, we chose a date and told leaders to get their folks ready. When the day came, staffers headed into the depots to back the leads up, agitating and mobilizing members to defend their breaks. 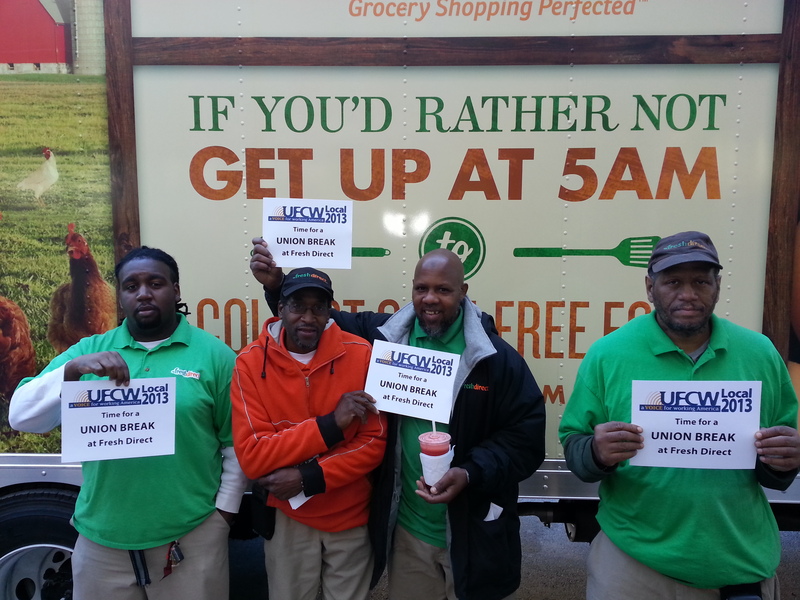 They brought signs that read, “TIME FOR A UNION BREAK AT FRESH DIRECT.” We took dozens of photos of members holding the signs, and published many on flyers and in the newsletter. Text messages helped encourage everyone who we couldn’t reach on site. Management didn’t say boo—at the time. Later, they admitted to members that shipments ran late, showing us it got their attention. And when we got to contract time, the issue still had legs. We made additional gains in contract language protecting breaks.